In that other thread, I drew characters from my fanfic. Here, instead, I make normal fanart. 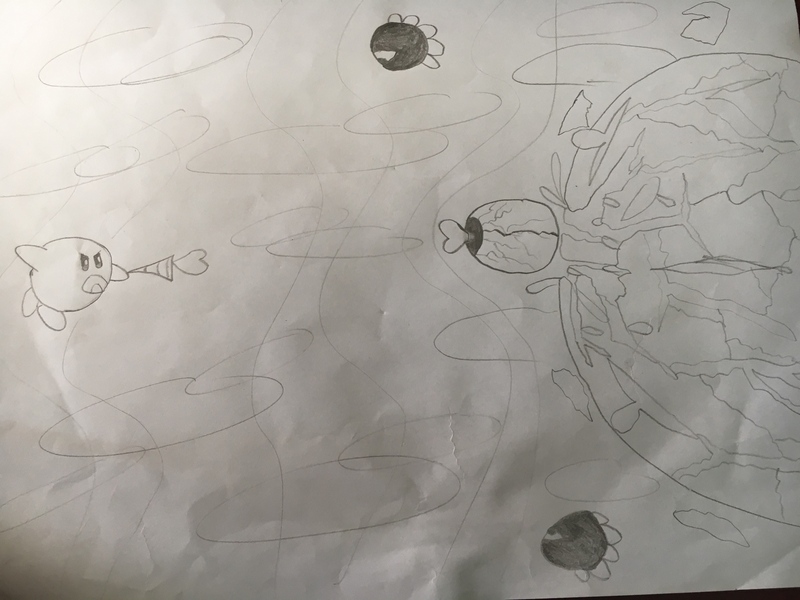 I will start by posting drawings made of paper that might (eventually) be made on computer. But for now, I’m just doing on paper. I made more, but for now I’m just posting this to see if anyone likes it. It would have been cooler to have the fetus outline, but I couldn't really... fit it in here, so I just drew faces all over the sheet. Anyway, Fan fact: Everyone but Giygas, Paula and Pokey are actually based on existing models of those characters. Ness' is a smash model, but in the image he was smiling and was making the peace sign, so I had to tweak him a bit. 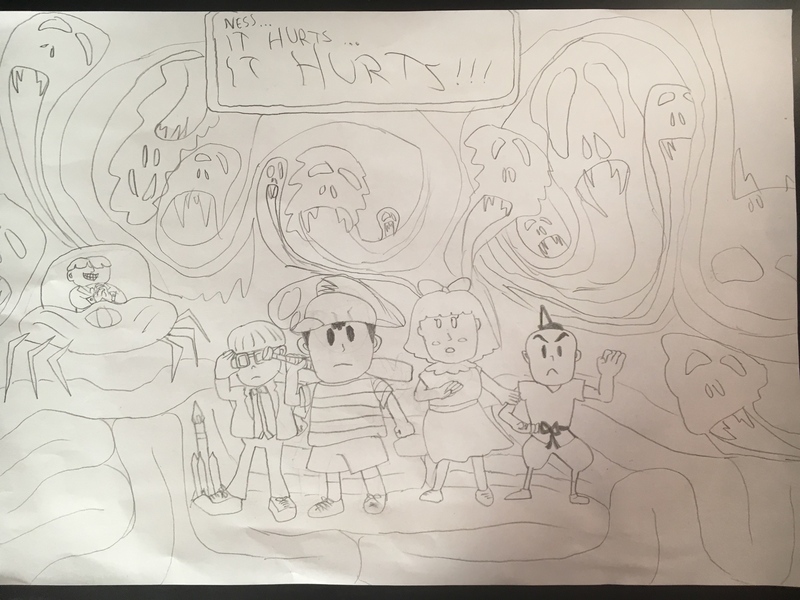 Anyway, the "It hurts" phrase was so iconic and representative of Giygas that I just HAD to include it here. Too bad Giygas isn't the scariest no-forror video game character for me, but again, that would be too popular of a choice. So I started making drawings with... sketches, which I never tried before, but it's actually pretty nice! 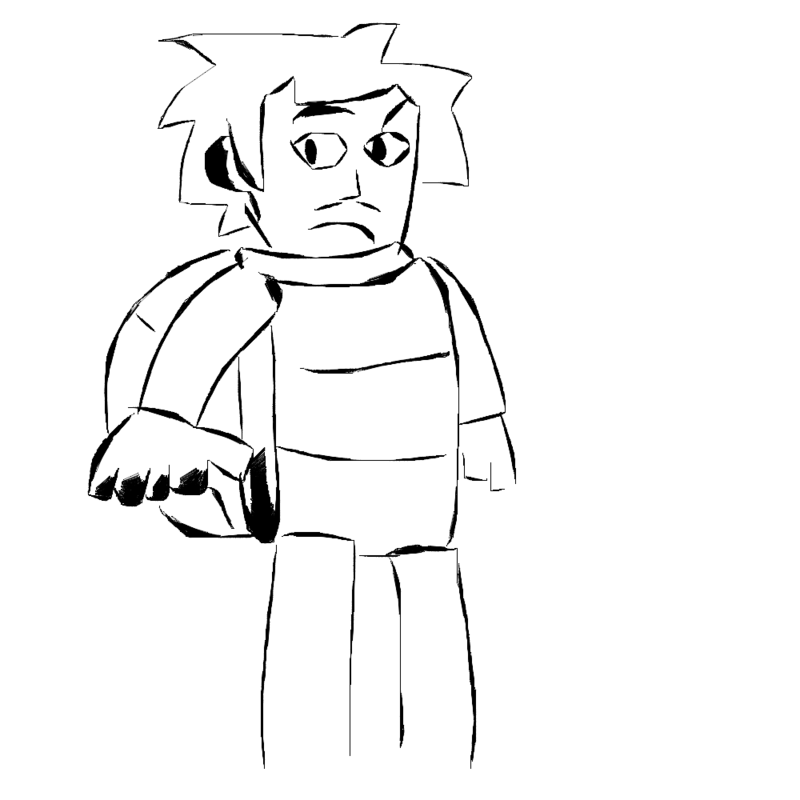 I mean I made that easily, so I might go with that style for some future drawings. Look at me in that style! Main problem here are the fingers and part of the shell, but I blame that on my laziness to undo the mistakes. Take care everyone... shall we visit the Hyper Zone next time? Kinda funny how a simple sprite of a boss was made so detailed and "cartoonishly gory". The little Dark Matters don't seem to give a crap, though. Meanwhile, Kirby, like the cute and kid-friendly Jigglypuff-minus-ears he is expertly rips apart Zero's eyeball from its... body, releasing an awesome amount of blood, so great that only hell itself can contain... you know, because this is a game for kids! I'm thinking about making some Smash thing next... and no, it's not a "Everyone is here 'cept Waluigi" kind of thing! Turns out Waluigi was not the only one that didn't make the cut as a playable character in Smash! Who knew? So yeah, I'm actually surprised to see that Eevee, one of the most iconic Pokemon in the franchise's history, has yet to become a fighter, even though others like Mewtwo, Lucario, and Geninja have earned their spot thanks to their relevance in their debut movies, but still! Pokemon Let's Go Eevee has his name for crying out loud! Decidueye... I personally can live without him since I don't know how relevant he is to Pokemon, but I do know that people refer to him as the next Pokemon that will enter Smash, so I said why not put him in here, since I needed a ninth charcater to balance out the drawing. What about Isabelle? What if we need more than one AC rep? She would definitely fit the bill (also since Tom Nook already is a part of Villager's Final Smash). 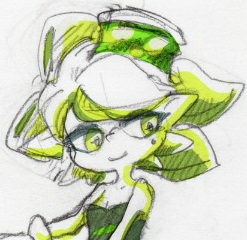 I would love to see her in the roster, even as an echo of Villager, but at least let people play as her! And don't get me started on Bandana Dee! He's now the only main Kirby character to not be a fighter! Just add him in, and that's it! You got the Kirby Dream Team from Return to Dreamland! But... it's a dream. While my need for Waluigi in smash has kinda decreased for some reason, I still think he should be there. Now that Daisy got in, anyone can. The reason why I would like to see Captain Toad is because of how great his moveset can be... well, all of these can have a great moveset, but you can be so creative with Captain Toad's! 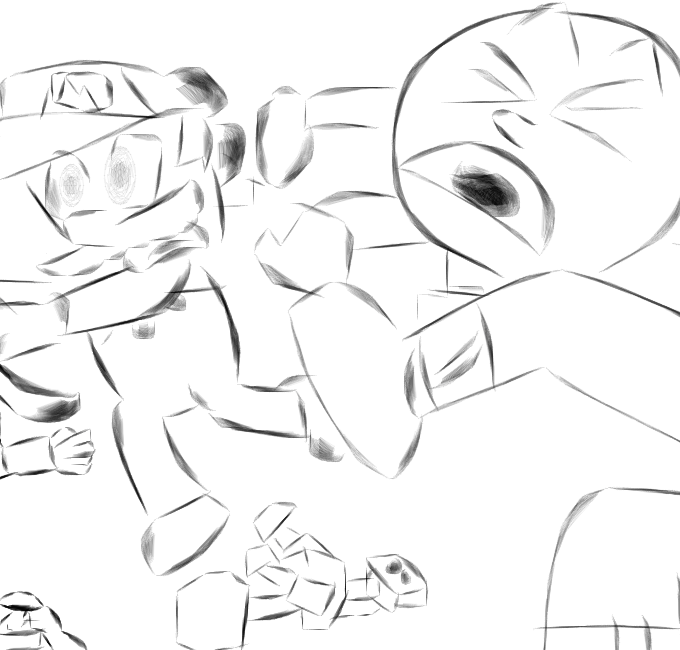 Let him use a Minecart, turnips, Double Cherries, Pickaxes, and for his final Smash, summon the StarShroom! Don't tell me you wouldn't want to see a StarShroom drill into your opponents! As for Impa, she's a major part of Zelda, and like Isabelle, if they want a new Zelda rep, they have to get her in! She's got a sword, magic, time travel! You can make quite a fighter with Impa. I don't know much about Krystal, but her inclusion in Ultimate as an assist trophy does show some hope in her fans' hearts, and is a step forward to her potential playable debut. And I know she would be an interesting character to have, as well as an additional Star Fox rep.
And last but not least, King K. Rool did fade in the relevance department a long time ago, but he is still popular among fans! Also, imagine how great of a moveset he can have thanks to his numerous alter egos he has! Sorry for the flashing, I'm taking this picture at night, so it was impossible to have that without my shadow getting in the way. Still hope you like it, this is one of my personal favorite as of yet! Enjoy! On the other hand, we should still enjoy what we have here already. So these... are my potential Smash mains. From least likely to most likely to become THE main, we have Ridley, Dr. Mario, R.O.B, Ike and Lucario in that order. 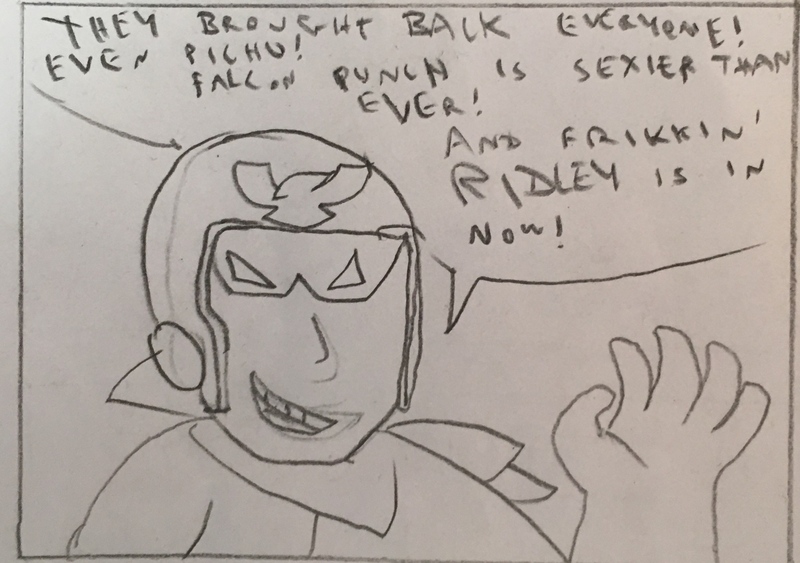 Ridley obvipusly is hype for everyone, and I sure am eager to give him a try to see what he does. His moveset seems nice already, and I especially love the move where he slides on the opponent through the stage. I heard that Dr. Mario too was a neat character, and that he was, in this game, better than regular Mario. People seem to like playing as him, and I will be one to see if what these people are saying is true. The amazing thing about R.O.B. is that they made a fighter out of a peripheral. Yet, his moveset comes off incredibly varied. He's another character who sounds fun to play as, but he was HELL to draw here, you can clearly see the attention to detial I wanted him to have. Ike is one of those characters who just... appeal to me. 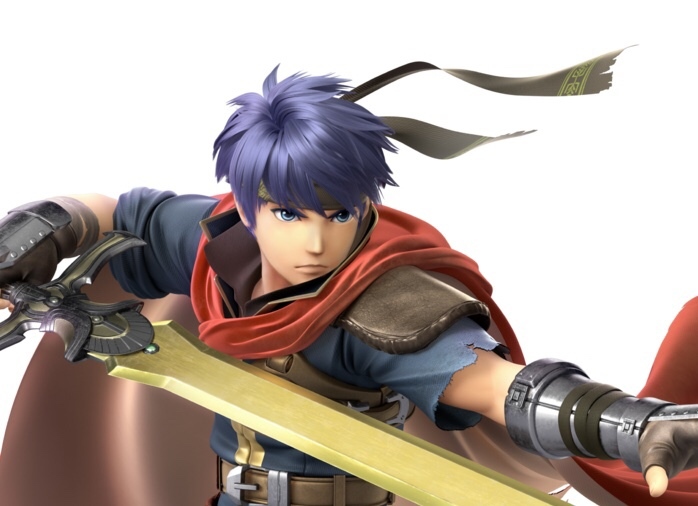 I feel like he's the kind of character that would be ideal for someone like me, and you know, he's probably already the best sword character in Smash if these five stay on top. And then, we have, well, a nice character that combines everything I said earlier. Lucario seems to be powerful, has a somewhat varied moveset (although I may be wrong on that one), and for some reason I just feel attracted to him. He looks so badass, and out of sheer curiosity I read about himin the Pokemon wiki, and it turns out... I like him! And well, he's kinda the only character here who is pretty much the icon of a deviant I actually watched recently. But all in all, these might not stay there forever, I might go for Fox instead of Dr, or even for Ganondorf or Link. But anyway, for now, these guys are cool, and I would totally main one of them. 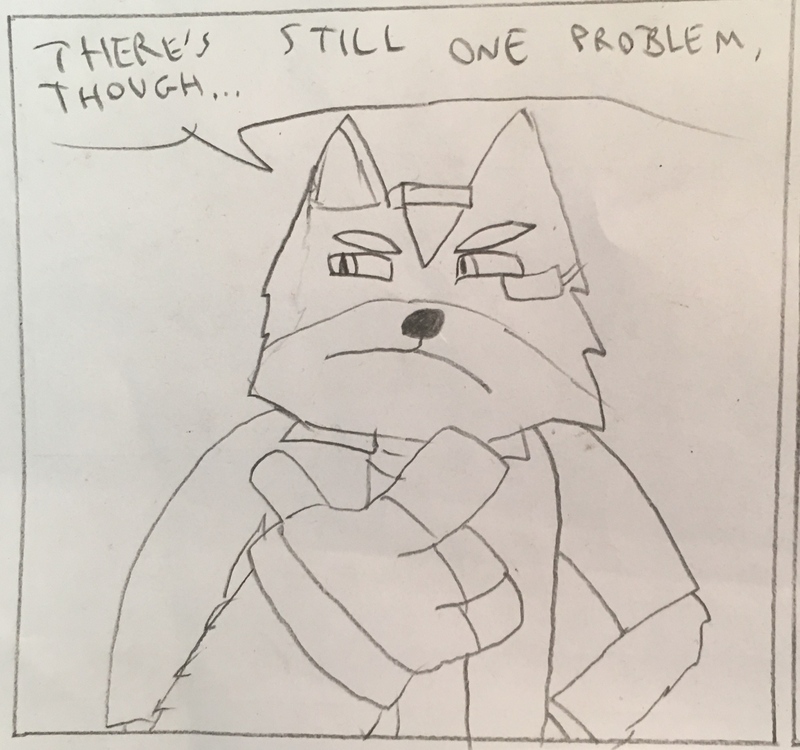 Also sorry for the random piece of eraser under Ike's foot, I apologize for that. 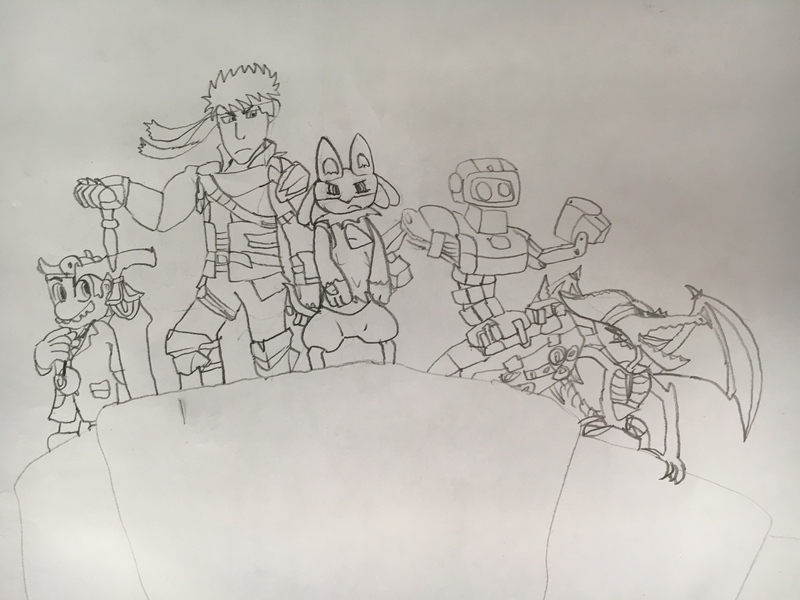 I'm now drawing the Smash cast ain't I? Let us start with Pokiman! .............Pokemon! That was... easy. 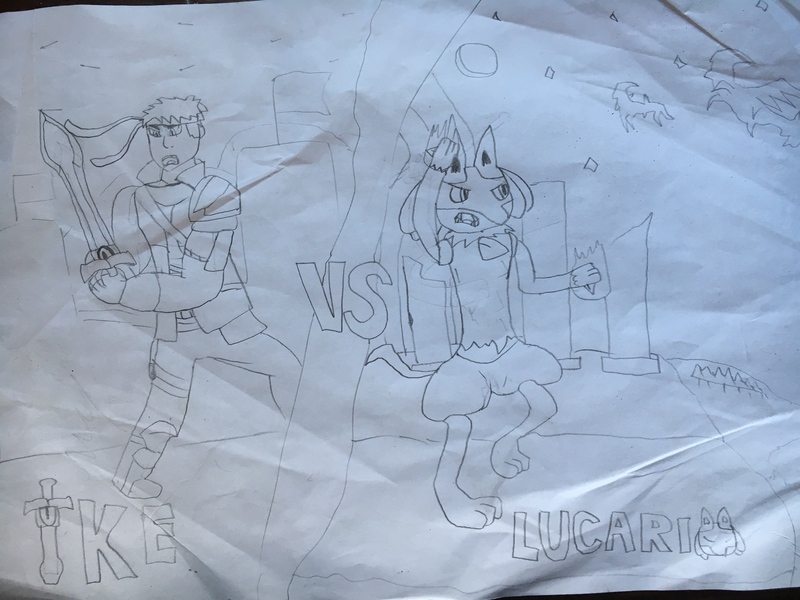 The hardest thing to make look right was Lucario... and he wasn't even hard! Goes to show that Pokemon are easy to draw. So these are all the Pokemon reps of Smash! 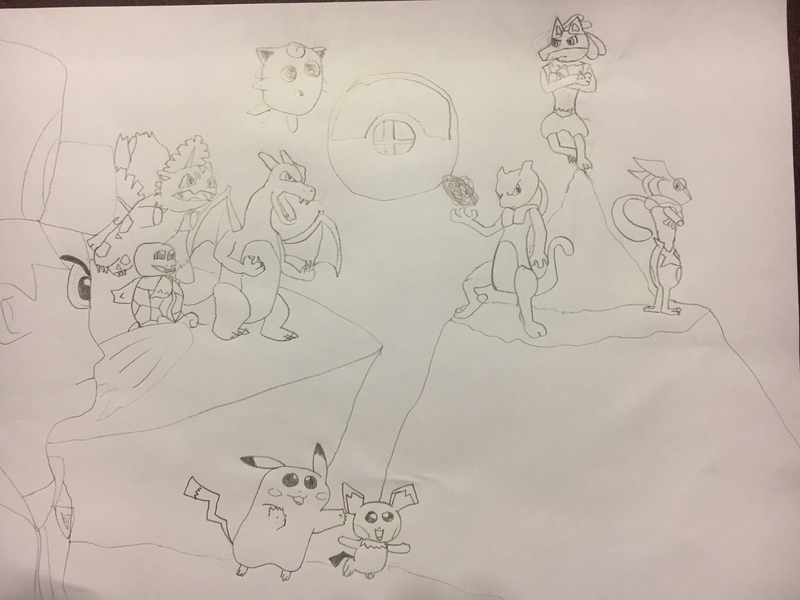 We got Red, The Pokemon Trainer, Squirtle, Ivysaur and Charizard on the left, Jigglypuff above of them, Pikachu and Pichu down there, and last but definitely not least, we got the three other pokemon, Mewtwo, Lucario and Greninja, from left to right. Anyway, this was fun to make, and I hope you like it too! More of this kind of drawing to come! 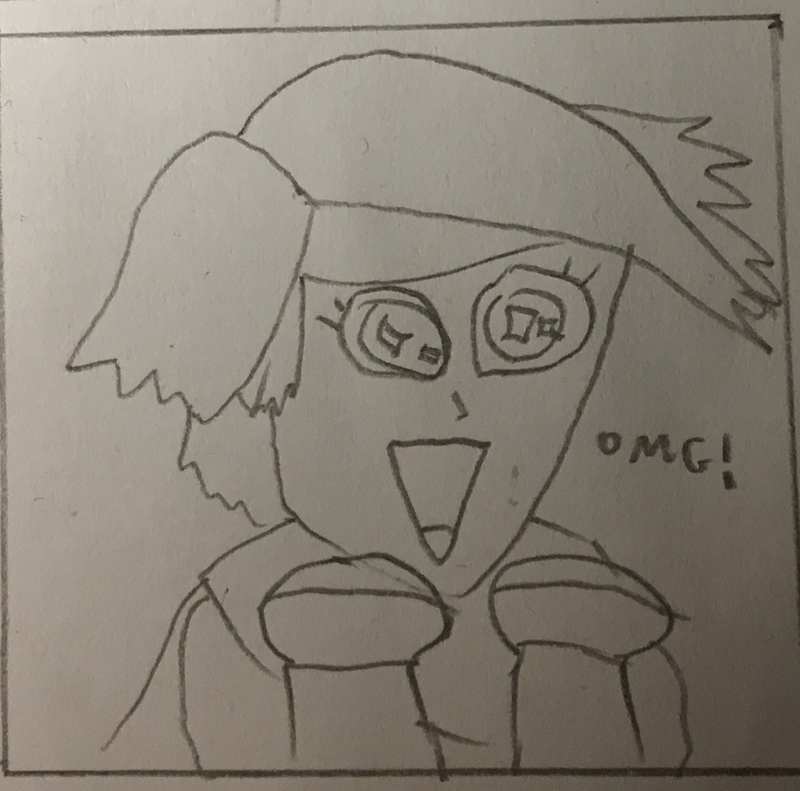 Teaser for my art contest entry. First of all... disclaimer, I'm not a furry. I just like (maybe even love) the character. That being said, a lot of you might know who it is, but I'm still throwing this out there. Anyway, I decided to expand on my OC's tragic anime backstory, so... I present to you... Kupario! 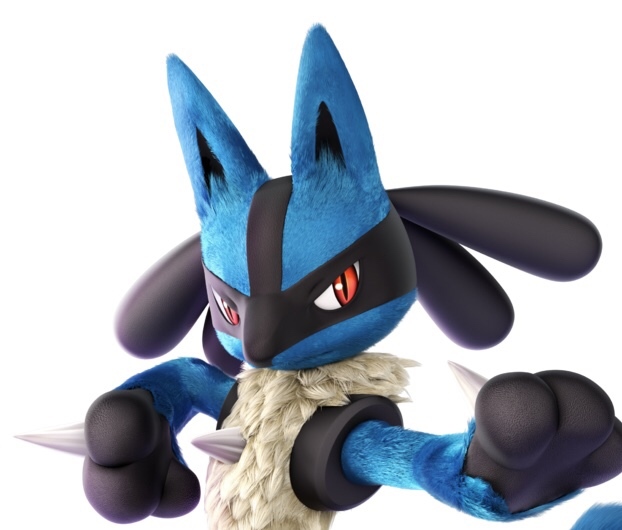 There are many reasons why I like Lucario this much... first of all, I am going to main him in Smash when Ultimate comes out, and while I jumped on Lucario as soon as the game got revealed, thing is, I studied various character movesets, and... Lucario just seems like a very fun character to play as. His design is also insanely cool. I mean there's something about a wolf-like (or jackal, your call) creature with a spike on its chest and paws. Out of curiosity, I read stuff about him on the Pokemon wiki, and Sir Aaron's Lucario was the one I really felt attracted to, and the fact that the Smash Lucario is based off of him (or is him, who knows?) only makes it better for me. Gotta respect a character voiced by Goku too. All in all... I really like Lucario. And even with such a badass design, I can't help but notice the cute side of this guy first. 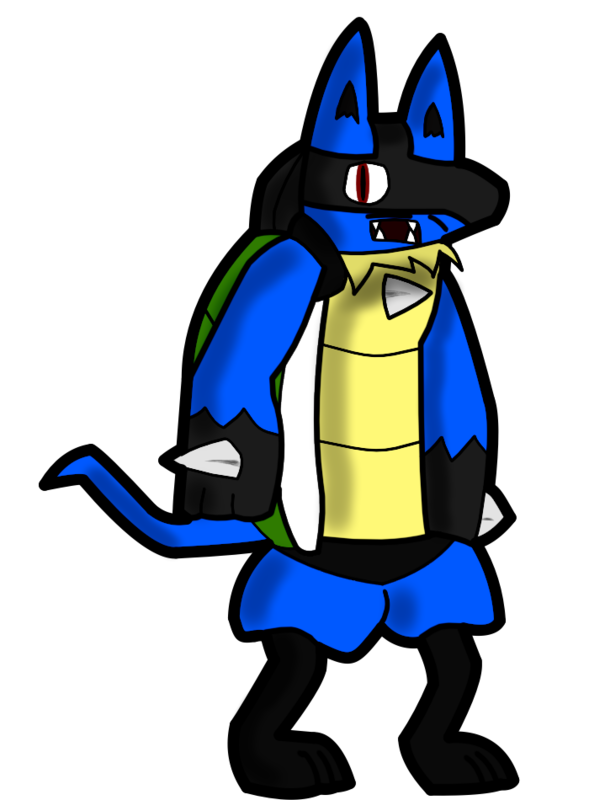 So... Kupario... is me as a Lucario. 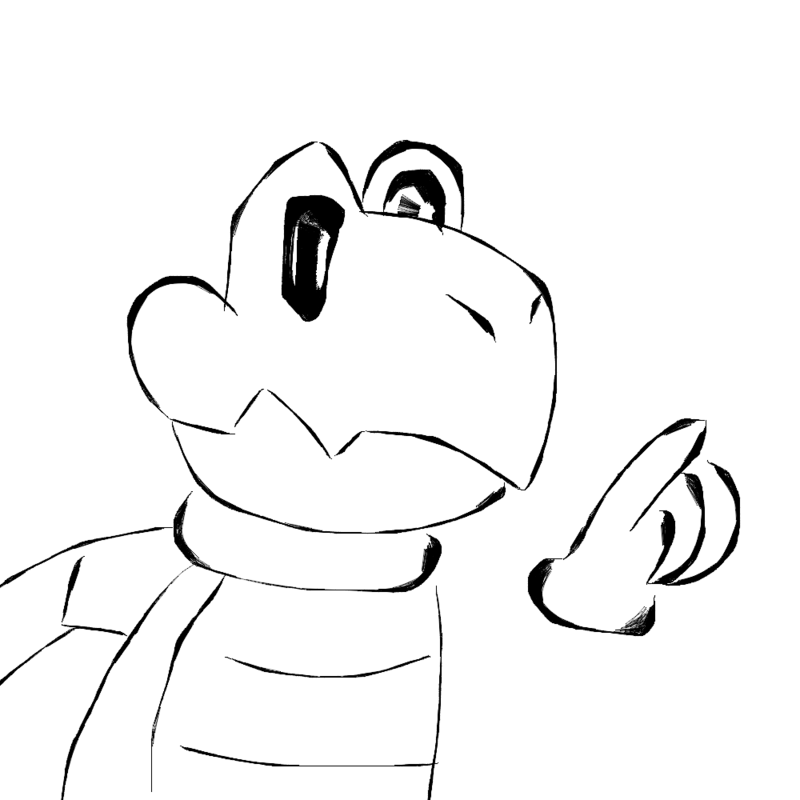 I don't know, maybe Koops can trnasform to become a Pokemon, or some werewolf kind of thing... or maybe it will be a permanent change in the character, but retaining his personality and humor. I don't know... what do you think? Should this design be definitive? Or should I just swap between this one and the other? Because keep in mind, both Koops and Kupario are the same character. 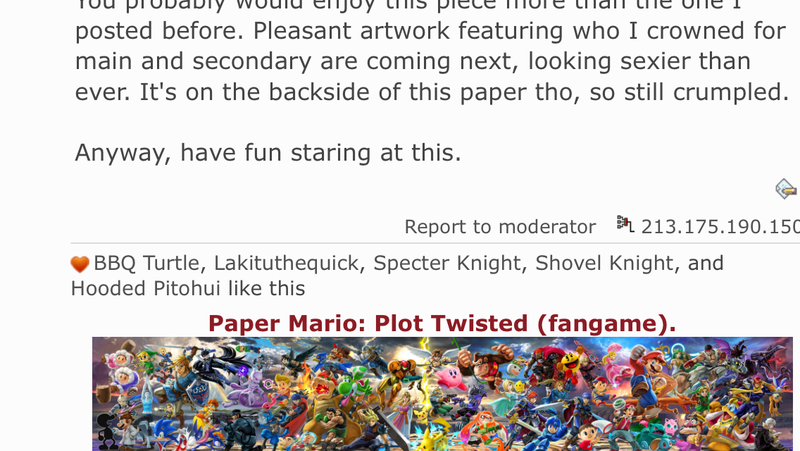 Edit: You know, the best part is, when I posted that, Lucario showed up in my rotating avatar. Ok now that I think of it it kinda throws me off. I should fix his shoulders, and perhaps remove the moustache. That was a Koops thing, not a Kupario thing. *bleep* I must redeem myself. Have this instead, Kupario is just gonna be a one-time thing. The paper started crumpling today, so I acted fast and took a photo. 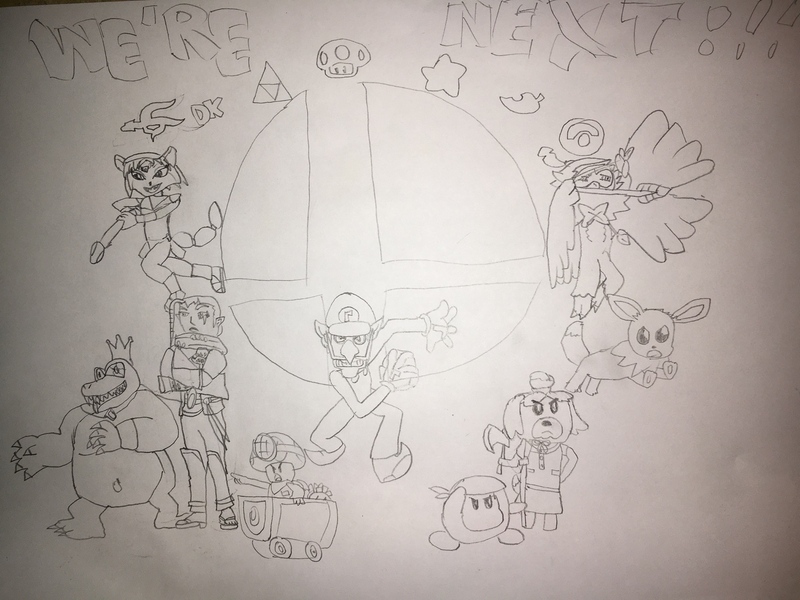 Could've added Pit and King Dedede, but I just had to post it now. Despite the paper's condition, this artwork shines and is probably the best one I've done on paper. Ridley, Ice Climbers, Snake, Red and Wolf are all down there because they are the ones people were excited to see. They were excited to see Young Link too, but why have two Links on here? Link is a pretty hard to draw character already, so um... deal with it. I decided to get ROB and Meta Knight up there because they can fly, so it would be cool to have them be where they are now. All of the original 12 fighters are featured, namely, Mario, DK, Link, Samus, Yoshi, Kirby, Fox, Pikachu, Luigi, Ness, Captain Falcon and Jigglypuff. Gotta love how Bowsitos isn't derpy for once in my drawings. True, it's mostly because it ain't Paper Bowser, but well, whattaya know? As for Melee characters, we got Mewtwo, Marth, Pichu, Mr. Game & Watch... that's it. Already mentioned Ice Climbers. Brawl newcomers here are Meta Knight, Snake, Ike, Red, Sonic, Lucario, ROB and Wolf. Brawl mewcomers truly were the best ones the series ever had. 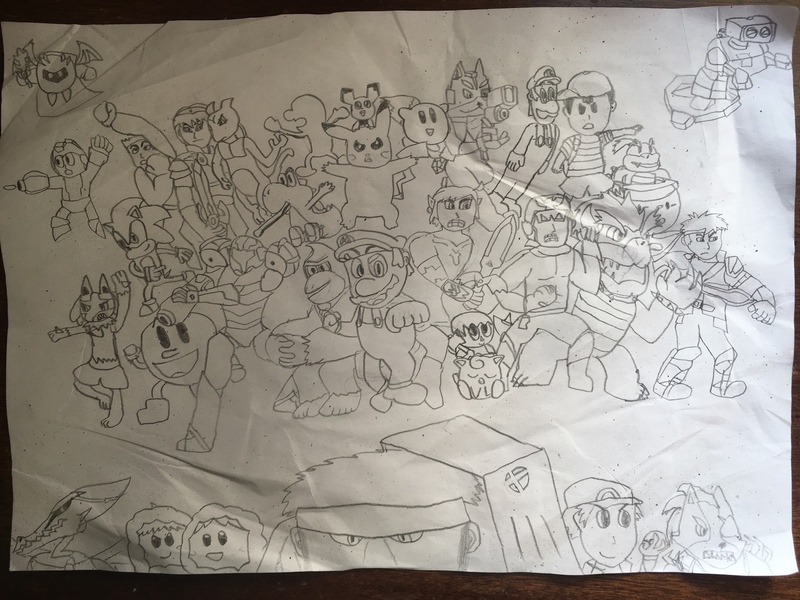 As for Smash 4 ones, there's Villager, MegaMan, Little Mac, PacMan and Bowser Jr.
You probably would enjoy this piece more than the one I posted before. Pleasant artwork featuring who I crowned for main and secondary are coming next, looking sexier than ever. It's on the backside of this paper tho, so still crumpled. Anyway, have fun staring at this. Why am I not surprised I just got a waterfall worth of likes after that other thing? 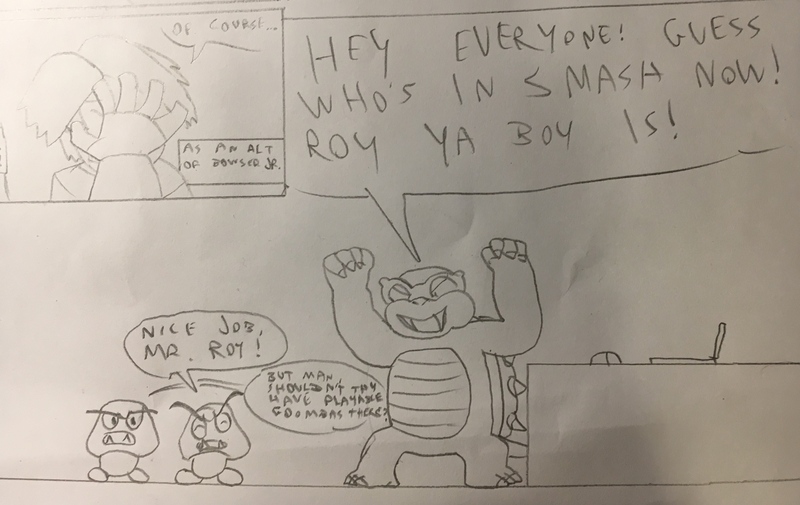 I have analyzed all (well, almost) movesets, dug up information about every character, and I, Koops, have chosen the ones truly worthy of a title that every character desires. I have chosen... my main and my secondary... solely based on movesets and character. Two challengers enter the ring! And who is this? Another fighter! Is this... is this? IT IS! So... one of these two... one of these two.... deserves to become my main. 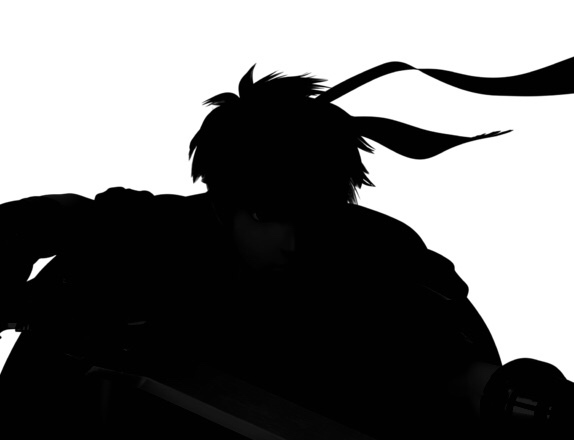 Will it be Ike? 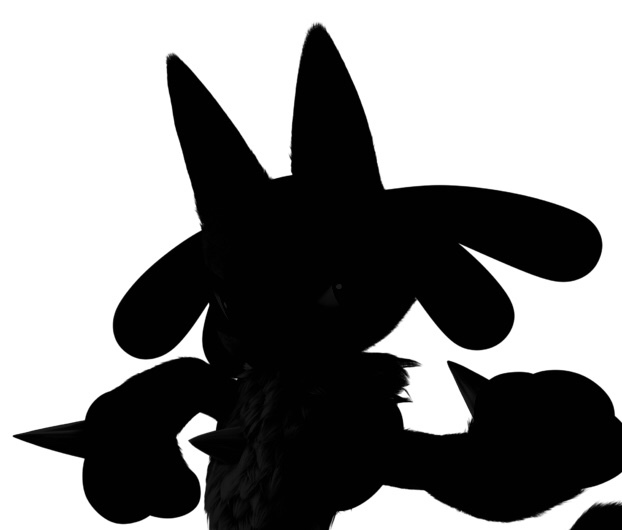 Or will it be Lucario? Will it be The Radiant Hero, or the Aura Pokemon? Does my main need a sword? Or are spikes attached to his paws and a chest enough? If you know me you'd know who I chose but... the reason we're here is to witness these two guys side by sides about to duke it out! Come on... can't we all agree they just look badass now? And for those who don't know... Lucario won that. ROB came in third in the tryouts, so he didn't get to show up, but he's glad he ended up on the top 3. Anyway, See Ya guys when I have something else to show ya! Bye! I don't think the Kupario thing is that weird. I think you should keep your normal OC as the main one, but I think it's fine for Kupario to show up every now and then. And don't worry, I don't think you're a furry, even if you do like certain furred characters. So... for the last five days, me and TG have been attending a daily course which initiated us to programming. Five types of programming to be precise, java, html, android apps, IOS apps, and last but not least, game development. While it was kinda incomplete, it did open some possibilites. Can't prpmise anything actually, but now I can actually see myself making a game, using the completely original character I have there in that other fanfic. Just without Mario characters... or species... as a fanfic, it will still exist, but if I wanna make it into an actual game, I gotta remove all Mario-related things. That way it will come off more original (and copyright issues as well I guess). While that does put Antonimus out of it since he's an Ant Trooper (but maybe I can change his species or something), Lucifer and Blurrgr are still gonna be in. But why am I posting this here and not there? 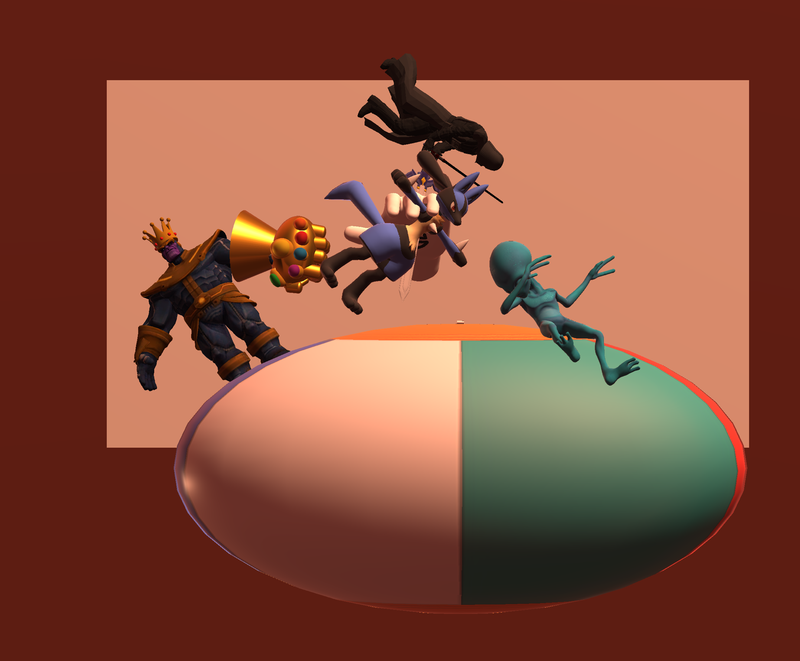 Because during some free time I had, I started tinkering around with Paint 3D, which my computer ain't strong enough to handle, to make this monstrosity... um masterpiece. Yup! Expect me to make 3D stuff in the future too! Two announcements in one post, dear lord, someone give us some bad news, we're not used to that! Anyway, the plot... is just as crazy as it looks. 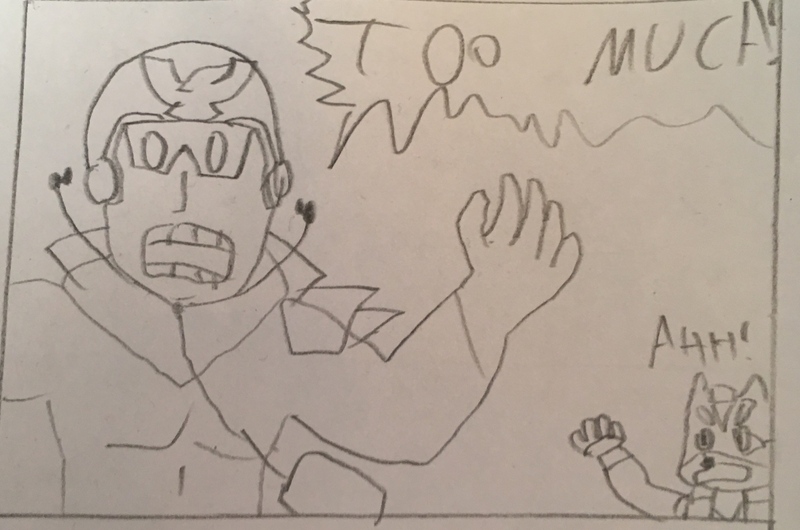 Master Hand (who has the Smash emblem drawn on himself if you look closely) kidnaps Lucario. But then, Darth Vader drops from the sky and thrusts the Master Sword into Master Hand's... body. To celebrate, the alien that's right there dabs... and Thanos... just exists... and looks like he just unboxed a Happy Meal. Oh, and notice how they're all on a giant beach ball. For a first 3D drawing, it sure ain't bad, and now I understand how to work with models... next step, posing! Anyway, that was what I wanted to share here, see ya! You were half-right, 64DD. 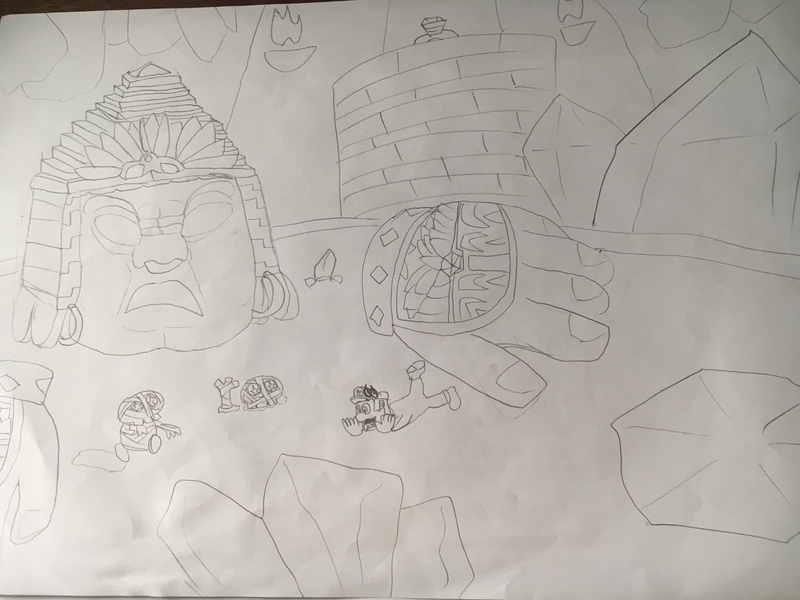 Here's my entry for the art contest. It WAS a bunch of characters getting their asses kicked by something, but it wasn't Waluigi causing it (come on that meme is dead now), instead it's Ridley! This is how he came into Smash, like a literal bomb! This thing is called "Ridley is pissed" because as you can see Ridley isn't exactly very happy. Or maybe he is happy but too excited not to unload the guns at the others. 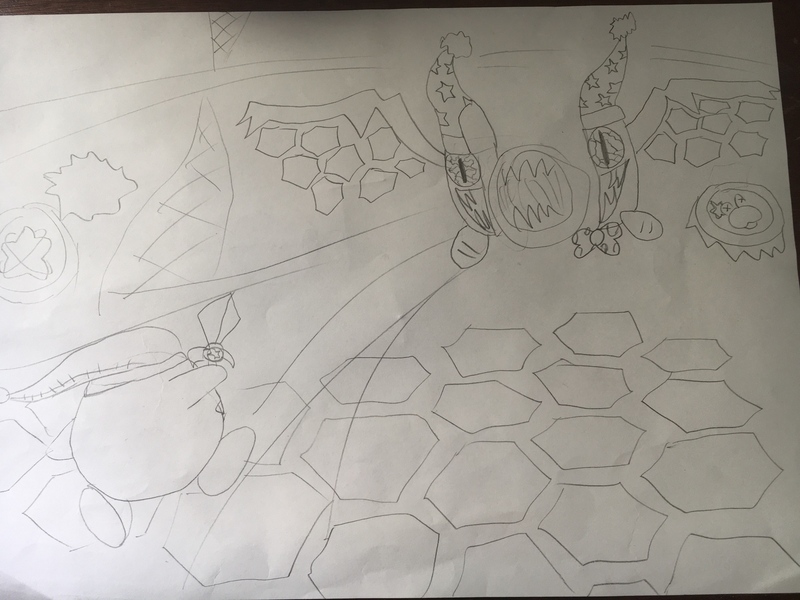 At first, this was supposed to just include Ridley, Samus Gunship (who knew Samus was a gunship), Mario, Captain Falcon and PacMan, but this is the Art Contest dammit I should do something bigger! So then, the duck hunt duo, MegaMan, Sheik, Lucario (Gee I wonder why he shows up in every post? ), ROB, Meta Knight and Pit. I WAS planning to include Ike somewhere, but eventually there was no more space for his, and I wasn't going to send him to the quantum realm so that he could fit in there. So hey that's it. It was the hardest drawing for me to make, took longer than your average drawing, but it's also the one I've had the most overall fun with. 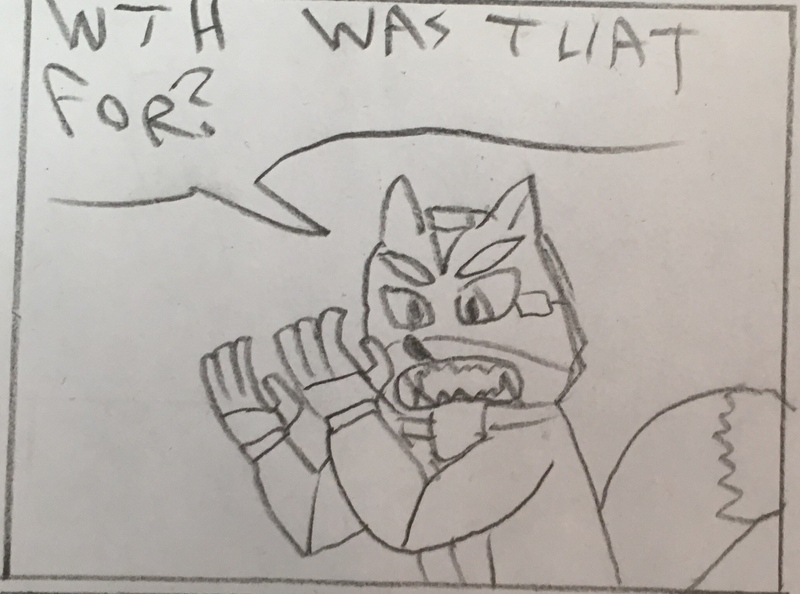 So I was thinking about since now I make tons of Smash fanart, maybe I should also do some little comic strips about the Smash characters... discussing Smash? I already got some in my mind. Anyway, that's it, hope you like it, and... vote for it in the poll if you like it the most! Well comic strip it is! Just in case there is something too unclear to read, I will have captions. 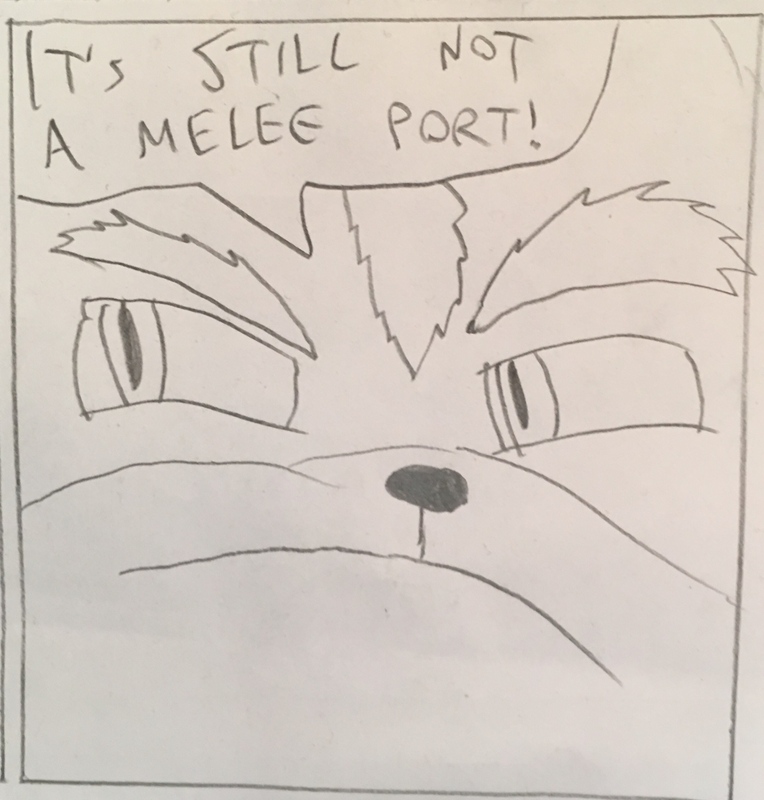 This comic takes place before Smash 4 was released. 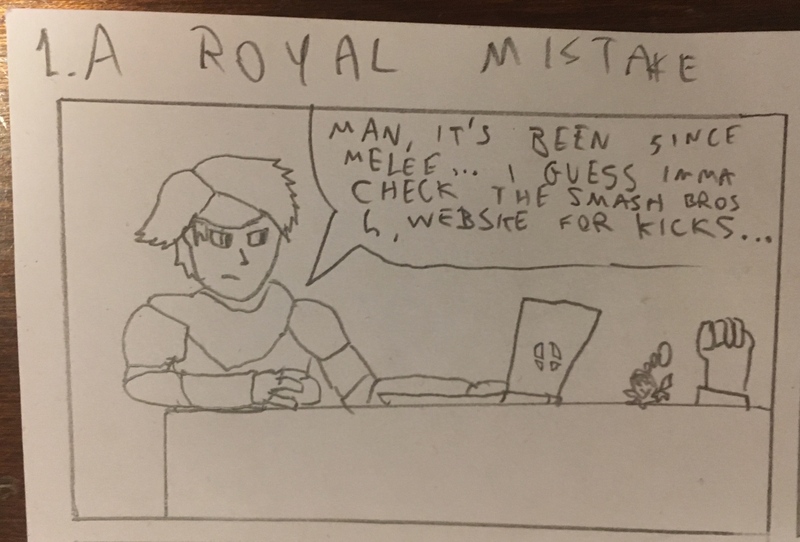 Roy: "Man, it's been since Melee! ... 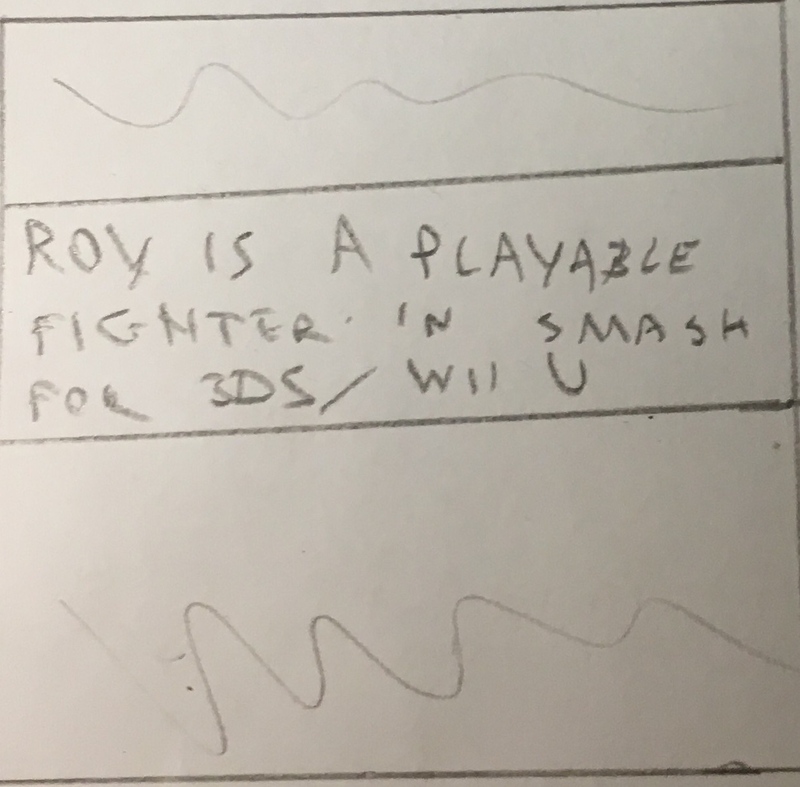 I guess Imma go check the Smash 4 website just for kicks..."
Roy: This is it! I can finally prove how great of a character I actually am (dang Melee hitboxes)! I can fight people again! 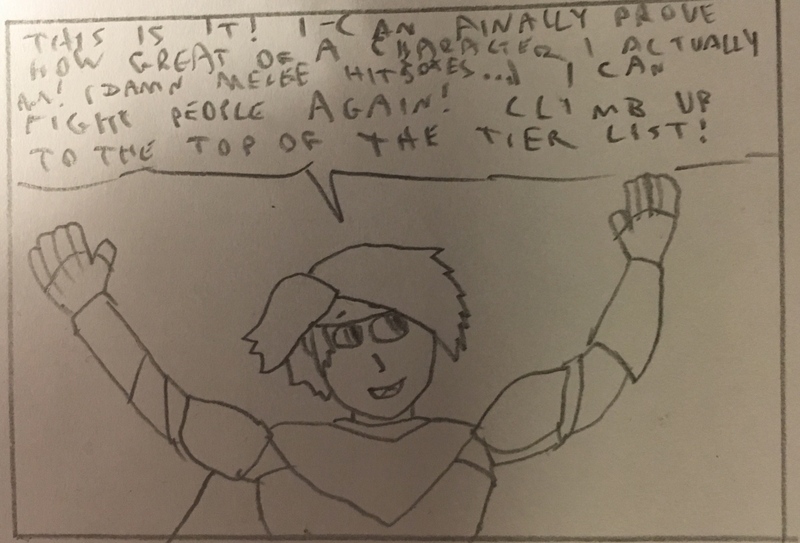 Climb up to the top of the tier list! Smash 4 website: As an alt of Bowser Jr.
Goomba 2: But man, shouldn't they have playable Goombas there? This has been fun. I plan on doing more. I even have more ideas with me at the moment. Hey looks like you like it! 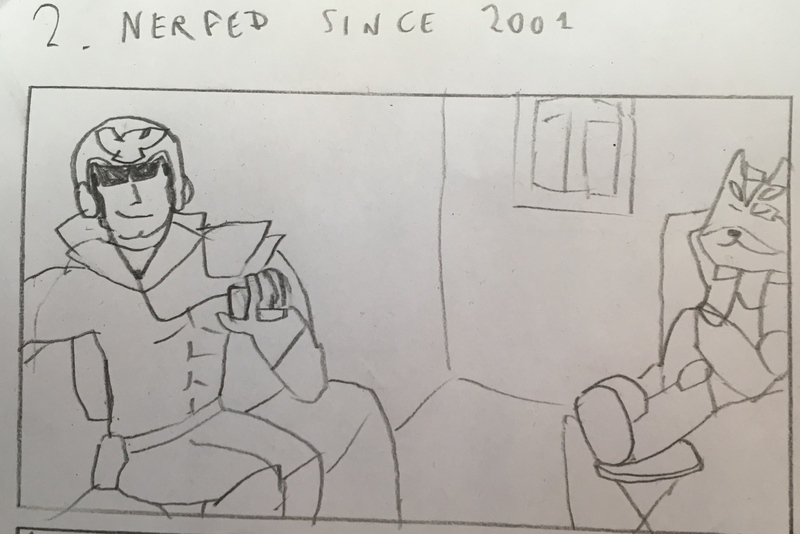 Well here is comic strip #2, "Nerfed since 2001", set after the Smash Ultimate reveal. Author's note: Cap looks weird here but it's just that panel. : Smash Ultimate looks too good to even bare! : You startled me man! I thought you had a heart attack! : They brought back everyone! Even Pichu! The Falcon Punch looks sexier than ever! And frikkin' RIDLEY is in, now! : Woah, Ridley? Wow, Sakurai is SERIOUS this time! Those who know what the Melee tier list was like can understand this. I know this joke kinda is overused, but it simply is about the character selection here! And really, I am proud of this Fox, easily the best one I've drawn. So yeah that's it for this one. I still have two I haven't shown, but I'll show them later because can't have too much of a good thing right?